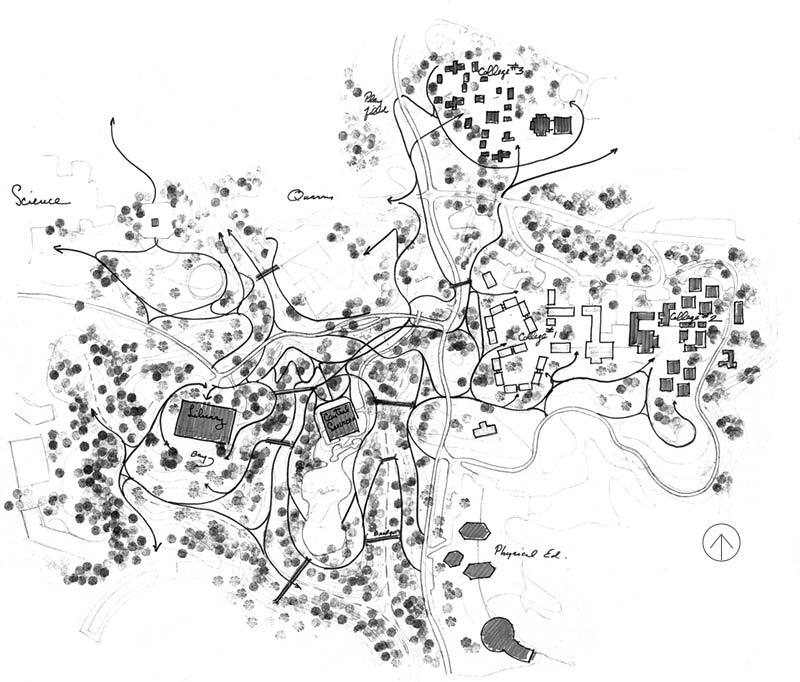 Established in the late 1950s on former ranch land at the head of Monterey Bay, the plan for this 2,000-acre campus was modeled after English residential colleges - each college is focused on a specific academic discipline, with its own dining hall, dormitories, and classrooms. 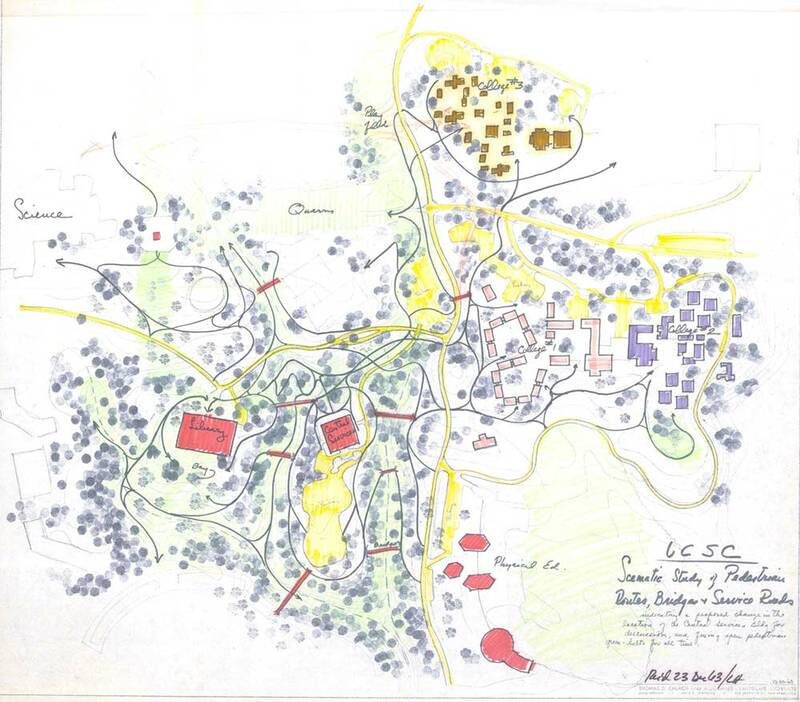 Halprin’s mentor, landscape architect Thomas Church, completed the campus master plan in a regional style that incorporated the native redwood forest and mountainous topography. Halprin was commissioned to design the landscapes at three of the residential colleges: Cowell College [photo opposite], Stevenson College, and Crown College. 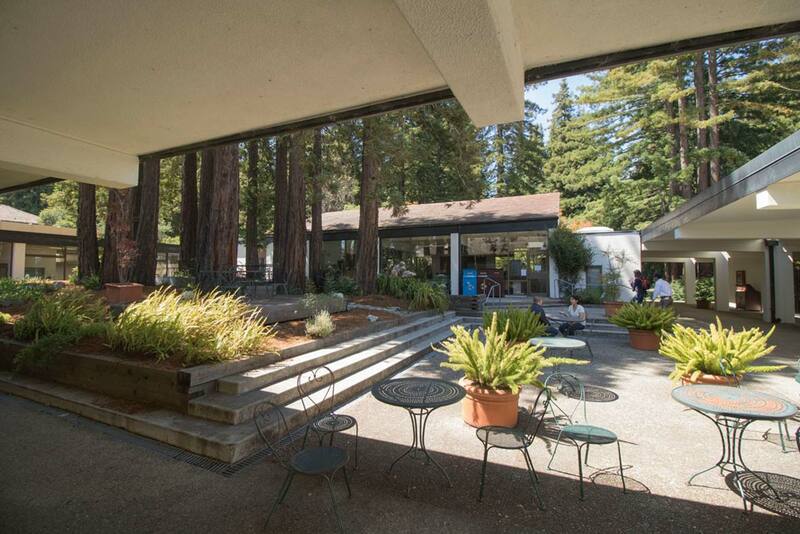 His designs incorporated the redwood groves and ocean views that are characteristic of the campus as a whole, while his individual design aesthetic is evident in the concrete terraced patios and abstract sculptures and fountains. 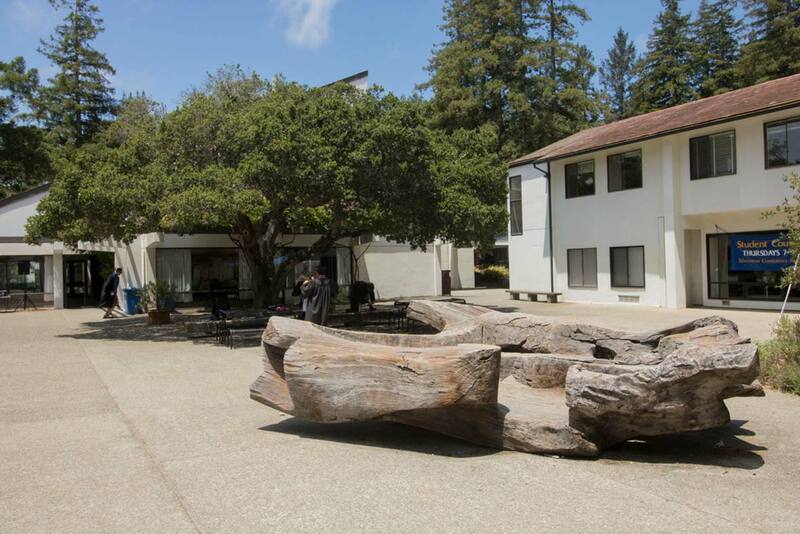 Of note, Halprin provided Bay Area artist J.B. Blunk with his first public commission in a courtyard at Stevenson College. Carved from a single piece of wood, Blunk's large-scale seating sculpture connected the concrete plaza with the forest beyond, and invited students to interact directly with the designed landscape. The campus, which has grown considerably since students first began attending classes during the 1960s (College Ten was completed in 2002), contains an unrivaled collection of postwar landscape architecture by masters of the profession including Thomas Church, Garrett Eckbo, and Dan Kiley. Unfortunately, the early design elements are beginning to show signs of aging and neglect. 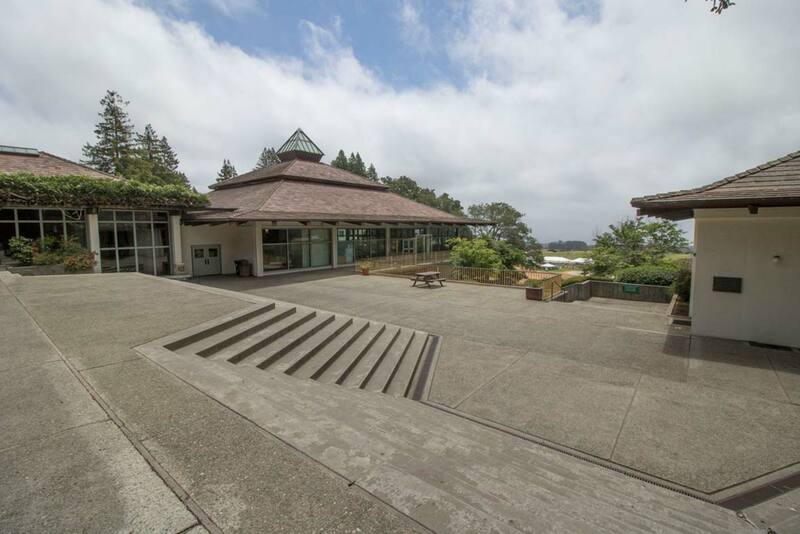 The best examples are evident at the outdoor amphitheater designed by landscape architect Robert Royston, and the original landscape at Merrill College designed by Royston, Hanamoto, Beck & Abbey. The university discontinued use of the amphitheater in 2006 and it has sat abandoned and unprotected over the last decade. 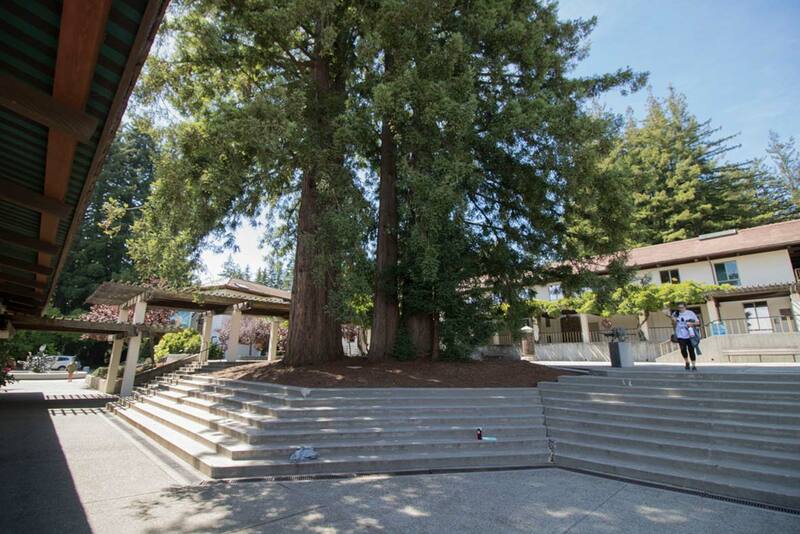 The seating areas have overgrown with volunteer redwoods, and the original redwood benches have begun to rot. Meanwhile, the landscape at Merrill has been mostly demolished to accommodate a complete renovation of the college. 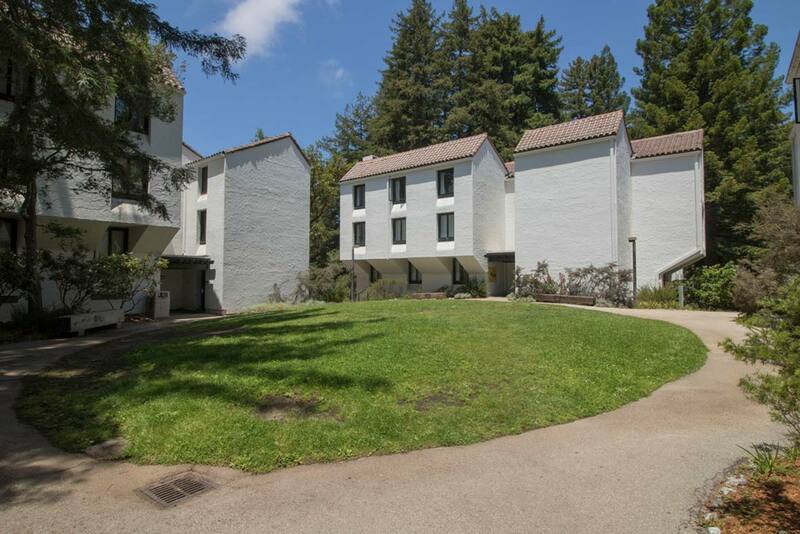 The landscapes designed by Halprin at Cowell, Stevenson, and Crown Colleges have not yet suffered the same level of neglect, but they are not recognized as an important part of the legacy at the university. Small changes, such as insensitive site furnishings (contemporary benches or traditional clay pots), disregard the holistic yet Modernist approach Halprin took in his designs. 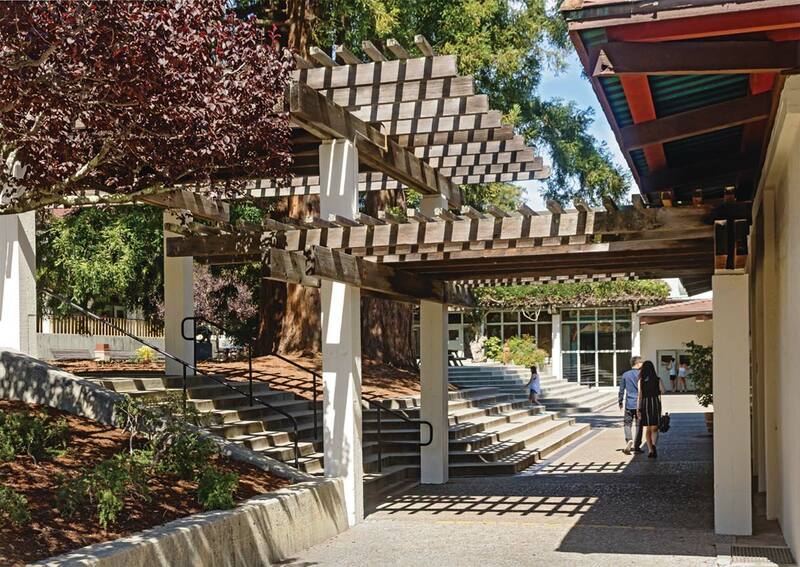 Furthermore, design features, such as the concrete steps at Cowell College are beginning to show signs of degradation and are in need of repair and long-term maintenance. The neglect of these landscapes is due in large part to a lack of understanding regarding both the historical significance of Modernism and the role of landscape architecture in shaping a sense of place. Raising the visibility of the important Modernist designers who contributed to the Master Plan for the campus and the design of its earliest colleges would help guide appropriate future treatment and interpretation. A campus-wide inventory and evaluation of historical resources would be a good first step in raising the visibility of this major landscape and component parts. This inventory and evaluation would also help in getting the campus listed in the National Register of Historic Places.